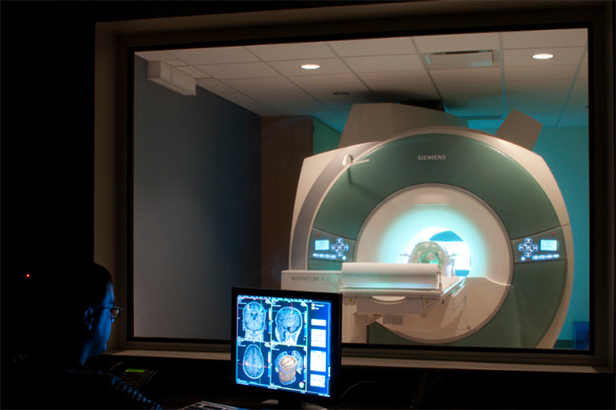 The Ohio State University Center for Cognitive and Behavioral Brain Imaging (CCBBI) is dedicated to pursuing structural and functional magnetic resonance studies using state-of-the-art techniques, to contributing to the development of future brain imaging modalities, and to disseminating knowledge about brain, mind and imaging to students and the public. Brain imaging shows us the critical building blocks of the mind and allows us to explore the brain processes underlying human behavior. Advancing our understanding of the relationship between mind and behavior truly will allow for transformative discoveries. CCBBI houses a new Siemens 3T Trio Functional Magnetic Resonance Imaging (TIM) System and ancillary equipment to support research spanning the cognitive and behavioral sciences. Zhong-Lin Lu, director of CCBBI and professor of psychology, is one of a handful of research scientists across the U.S. selected to share $13.1 million for 16 new awards that are part of NSF’s support for integrative, fundamental brain research and the BRAIN initiative. Lu will apply a new modeling framework that integrates brain imaging with individuals’ behavior information — a new approach that could revolutionize the field of cognitive neuroscience. In 2012, alumnus H. Dean Gibson (BA, sociology, 1974) and Susan Regis Gibson generously established the H. Dean and Susan Regis Gibson Fund for the Center for Cognitive and Behavioral Brain Imaging to support outstanding graduate or undergraduate students with particular attention but not limited to female students to conduct brain imaging at CCBBI. The CCBBI hosts monthly MRI users meetings to foster the exchange of experience and expertise in neuroimaging among MRI users at Ohio State. Each colloquium is followed by an open forum discussion on the topic. Pilot Scans: The CCBBI provides pilot study time to help researchers at OSU to launch their imaging studies. CCBBI offers scholarship programs that encourage graduate and undergraduate research. The H. Dean and Susan Regis Gibson Research Award is given to outstanding graduate or undergraduate students with particular attention, but not limited to, female students to conduct brain imaging research in the Center. CCBBI provides facility tours and educational programming for prospective and incoming students interested in the brain sciences or related fields. The Center routinely partners with the new Neuroscience Undergraduate Program, as well as branch campuses. Additionally, the Center facilitates tours and meetings with fMRI researchers in support of faculty recruitment processes in the College. CCBBI provides educational activities including programming, presentations and facility tours for the public, ranging from junior high school students to professional seminars. A few examples include STEM events such as Breakfast of Science Champions, Honors Recruitment, Show-and-Tell Open Houses and the STEM I-CAN Initiative. CCBBI conducts a graduate level course in fMRI in which students learn imaging techniques including programming, data collection and analysis, safety protocol, and equipment operation. The students conduct their own research studies with supervision.